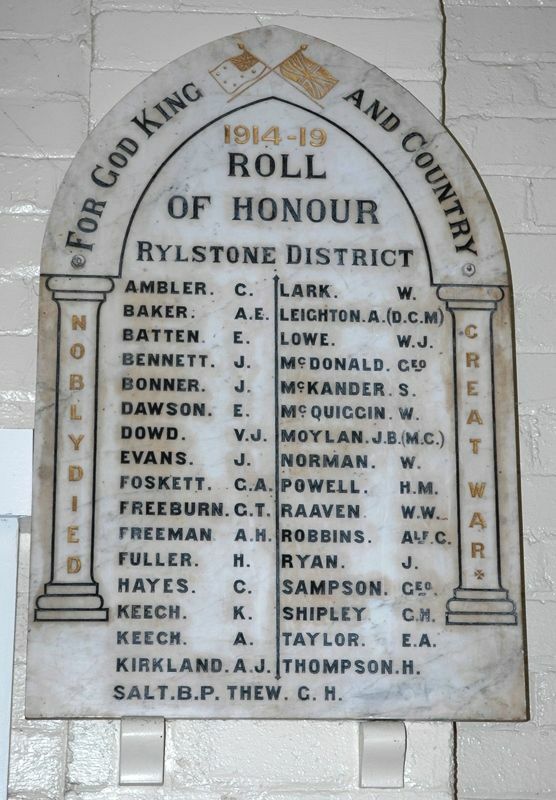 During the progress of the war, Mr. D. B. Acton, then of Mudgee, promised Mr. J R. Fletcher that he would present to the Rylstone Shire Council a marble honor roll. Through being overcarried Mr. Acton's worthy gift did not arrive before Mr. Fletcher's term as Shire President expired. Consequently no date could be given as to the unveiling. The parcel duly arrived last week, and as advertised will be unveiled on Saturday afternoon at half-past three o'clock at the Shire Hall by Mr. Fletcher, who will perform the ceremony at the request of the Repatriation Committee. The ceremony in connection with the unveiling will be an impressive one. It will take the shape of a procession, in which a gun team, kindly supplied by the Rawden Estate, will take part. The Kandos and Rylstone bands will also be in the procession. Appropriate speeches will be delivered, and the "Last Post" will be sounded. The public are invited to be present, and no doubt a large assemblage will honor the occasion, and thus pay tribute to the memory of the boys who forfeited their lives in the mammoth fight for the world's freedom and liberty. The district appreciation goes out to Mr. "Denny" Acton for the tribute to district patriotism as is expressed in the very fine tablet that he has handed over to the Shire. We all know Mr. Acton, either personally or by repute. He is a man who calls a spade a spade. His criticism is as fearless as his nature is generous, and in the manifestation of goodwill towards us, which has enabled the district to pay a further reverence to the name of those who perished by the war, he has sustained that fine character which for years has endeared him to the Mudgee district as a citizen and friend. The tablet is of exquisite design. It is of polished marble emblematically designed with a covering of the Union Jack and Australian Flag, and finished off in a fitting manner with the name of the fallen finely executed on the tablet. It will hand down to posterity the memory of the lads who fought and died in the greatest war in history.